A classic selection of five cheeses designed to make a truly great cheeseboard. 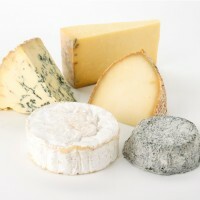 Five cheeses from England and France that have been chosen for their consistent quality and taste. This collection fits perfectly in one of our stylish medium gift boxes, why not add one to your order for a complete gift experience? Stilton PDO Pasteurised Cows' Milk, Vegetarian. Stilton cheese has its origins in the early 19th Century when travellers to the Bell Inn in the village of Stilton on the Great North Road found a cheese that was much to their liking. So many people started producing similar cheeses that in 1910 the producers had the foresight to lay down strict controls on where and how it could be made, including that it may only be produced in the three counties of Leicestershire, Nottinghamshire and Derbyshire. Our creamy mellow Stilton will fill the mouth with flavour but not be overpowering. The pleasant herby tang of the blue veining contrasts nicely with the rich creamy character of the paste. Westcombe Cheddar PDO Unpasteurised Cows' Milk, Traditional. Westcombe Cheddar is one of only three cheeses entitled to the Slow Food designation "Artisan Somerset Cheddar". To qualify for this the cheese must be made in Somerset using unpasteurised milk from the farm's own cows, traditional rennet and be made by hand before being matured for up to 20 months. It is made in Evercreech near Shepton Mallet and has a complex flavour and a more moist texture than some Cheddars. Berkswell Unpasteurised Sheeps' Milk, Vegetarian. The Fletcher family started making and maturing the cheese on their farm in Warwickshire in the late1980s. As the demand for the cheese has increased so has production but in a very controlled way to assure the superb quality of the cheese. Made in the style of a Pyrenean cheese, This exquisite hard sheep's milk cheese is simultaneously nutty, savoury and fruity. Selles Sur Cher PDO, Unpasteurised goats’ milk, traditional, Selles sur Cher is one of France's more recent Appellation Controlee cheeses, being granted this status in 1975 (modified in 1996). It has however been made for centuries by farmers for their families’ consumption. The recipe has been passed from generation to generation as a useful way of using their goats’ milk. Produced in an area south of Blois in the Loire valley, Selles sur Cher is a small disc of cheese with a very fine coating of ash on which grows a fine blue/white mould. The interior of the cheese is fine textured, succulent and velvety. The smell is of walnuts. The lingering flavour is also nutty, slightly sour and salty with a hint of sweetness.